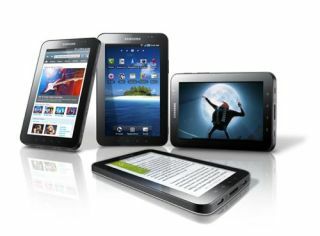 Samsung has officially unveiled its iPad rival at IFA 2010, the 7-inch Android based Samsung Galaxy Tab. Boasting dimensions of 19x120x12mm, the 7-inch tablet utilises WSVGA (1024x600) TFT screen technology and is packing Android 2.2 (FroYo). Samsung is clearly proud of its seven inch wonder, saying the device "is pushing the market in new directions and Samsung believes this is only the beginning of its innovations as pioneers in smart media devices." The Galaxy Tab also has a front-facing camera which allows for face-to-face video phoning over 3G, a rear-facing camera captures still images and video (the camera is 3MP and is equipped with an LED flash) and it allows you to email and SMS to your heart's content. The Samsung Galaxy Tab runs Flash too, and has the ability to play back Full HD video. Like the iPad it will be using a microSIM for connectivity, so expect a wave of telcos announcing they will be supporting the device soon. There's no news on an official UK release date or pricing but Samsung is hinting it will be available "in the coming months".